With its big, round eyes and long snout, Blyth's flying fox (Pteropus melanotus) is aptly named for its fox-like face. The large ears have well-rounded tips and are black, hence its alternative common name of black-eared flying fox. 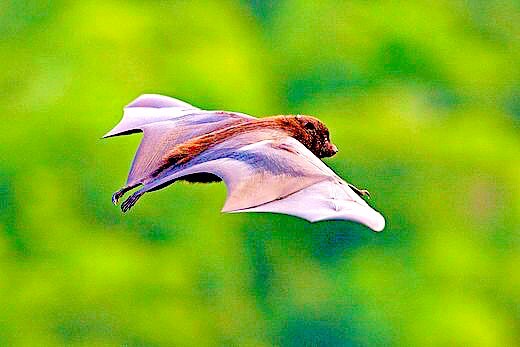 The coat colour of Blyth's flying fox depends on the island it inhabits. In general, those from the Nicobar Islands have a brown head and reddish body, while the inhabitants of Andaman Islands tend to have a black head and brown body with grey stripes. Individuals on Christmas Island typically have blackish or dark brown fur, peppered with greyish-white hairs, and a slightly paler wash on the back of the neck. Male and female Blyth's flying foxes do not differ in size, but females tend to be darker than males. Copyright Info AnimmalPicturesArchive.com does not have the copyright for this image. This photograph or artwork is copyright by the photographer or the original artist. If you are to use this photograph, please contact the copyright owner or the poster.